A ureteral reimplant was the operation to change the location of the ureters into the bladder. The ureters are the tubes that will drain the urine from the kidney to the bladder. 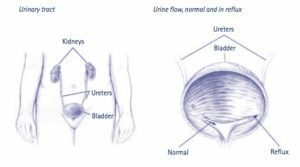 The treatment will stops reflux of the urine from the bladder into the kidney/s or relieves barrier of the ureter as it enters the bladder. The operation usually takes 1-2 hours. Based on the child’s condition and surgeon’s experience, patient can go home at the same day or will stay overnight. Most of the patients were able to go home at the same day following the procedure. The operation will be done under general anesthesia. A dose of antibiotics was given to decrease the chance of urinary tract infections. The operation was done by a small cut or incision on the lower abdomen, below the bikini line. The bladder was opened and one or both the ureters were detached at their entry into the bladder from inside. If the surgery was done for the blockage (VUJ obstruction), the ureter(s) will need to be shortened and tapered. New tunnels were made in between the bladder muscle & the lining of the bladder, imitates the normal state. The ureters were laid in these tunnels & secured the bladder with dissolving stitches. To support the new link between the ureter and bladder, and help to heal it in the correct position, a ‘stent’ was usually left inside for some time. A stent was a fine plastic tube, which will runs from a curl in renal pelvis to the curl in the bladder. This will work like a straw (which helps urine to drain by the area of swelling) as well as a splint (that was used to join the heal in a optimal location). This was a temporary device, removed after 4-6 weeks when surgery was done. A catheter (tube) was usually left in the bladder overnight. This generally drains blood-stained urine. In addition, an external drain tube will be left at the wound. Regular oral pain relief was given. The bladder catheter was generally removed at the first postoperative day, and the child will be discharged home after drinking and voiding. Bladder spasms were usual about 5 days after the surgery. There are few medications that may help, but reassurance and warm baths do.